Endless Turns | Just Shooting Memories! 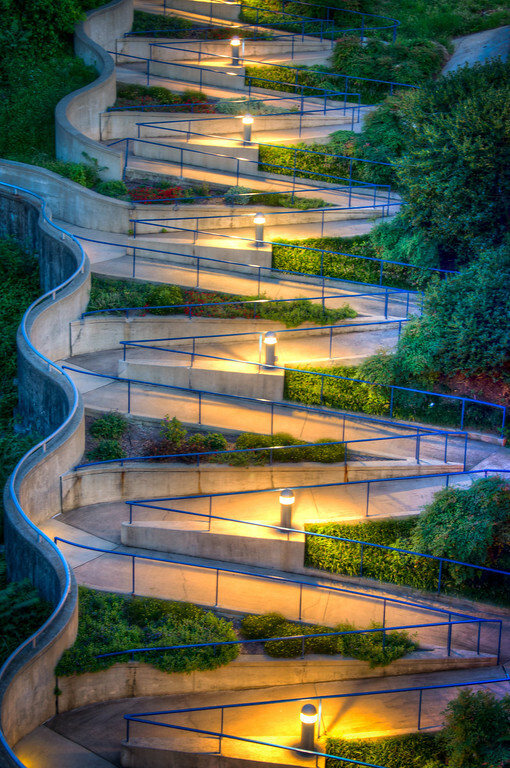 This walkway goes from the Hunter Museum down to the river front in Chattanooga. It is not a trek for the faint of heart as this is not the majority of the walkway. When the path gets to the bottom, there is a small amphitheater under the bridge. I ran across a musician playing a didgeridoo. Nothing like some alien music being played and the only people present were me, the musician and a homeless person. I really was working on Finding the Troll under the bridge and the music just added to it. Made me think of some low budget horror flick and I was just waiting for the mass murderer to walk up behind me. Great combination of colors, lines and symmetry.